Mexico’s future is looking brighter. Like the United States, it is benefitting from rising costs in China, which are bringing manufacturing closer to the American consumer. Mexico’s growing prosperity is making many American companies court its consumers. At the same time, improved economic conditions and lower birth rates are reducing migration from Mexico to the United States. Mexico is experiencing an economic resurgence and seems poised for strong growth in the next few years. Some observers are talking about the rise of the “Aztec tiger.” The nation of 115 million, currently the world’s 14th largest economy, could be among the world’s 10 biggest economies by the end of this decade. It is expected to compete successfully for manufacturing work against China, India and Brazil. Mexico enjoys economic stability and a forecast for strong growth and improved social mobility. Last year, foreign investors pumped $57 billion into Mexican stocks and bonds, five times what they invested in Brazil. Big manufacturers like Bombardier and General Electric are expanding their facilities there and creating high-wage jobs. Mexico saw its economy grow by 4 percent in 2012, a rate that is expected to reach as much as 7 percent a year in the near future. Years of effective economic policies and an embrace of free trade along with recent political changes are solid foundations for economic expansion. Mexico has signed 44 free trade agreements — more than any country in the world. According to The Financial Times, that is more than twice as many as China and four times more than Brazil. After the 1995 peso crisis roiled international markets, Mexico started living within its means. The fiscal discipline has contributed to steady economic growth. Mexico trade pacts have opened it to the world. Hope for reduced political corruption grew after last December’s swearing-in of President Enrique Peña Nieto. The Organization of Economic Cooperation and Development now classifies Mexico as a majority middle-class society. Average income has doubled in the past 15 years. A quarter of the country’s homes were built within the past two decades. Mexico has made major investments in its railroads, highways and seaports, which will help its economy expand. Mexico still has major challenges to surmount – the violence of the drug trade, an inadequate educational system and corruption. Although millions of Mexicans have entered the middle class in the last 15 years, nearly half the population remains poor, living on $80 a month or less. Mexico’s consumer market is vital to many U.S. companies and is likely to become more important as its economy expands. The World Bank ranks Mexico as the world’s 11th largest economy in purchasing power. Mexico is the world’s top per capita consumer of Coca-Cola and has more Walmart stores per capita than the United States. About 50 percent of Mexico’s imports come from the United States. Mexico imports more U.S. goods than any country except Canada and more than Germany, France and the United Kingdom combined. Some experts believe that ““Hecho en Mexico” – Made in Mexico – will become as common in the next 15 years as “Made in China” has been in the past 15. Mexico already exports more manufactured goods than the rest of Latin America combined. It is the No. 1 exporter of beer and the fourth largest exporter of automobiles. Its factories are the world’s top producers of refrigerators and flat screen televisions. Its electronics exports grew 73 percent between 2002 and 2012, and now it is becoming a major aerospace manufacturer. Some of the same factors that are making American companies “re-shore” production from China to the United States are making American and European companies consider manufacturing in Mexico. Some experts refer to that as “nearshoring.” Bringing production to Mexico can bring it closer to American consumers, reduce transportation costs, simplify logistics and make it easier to access reliable suppliers. Because of the North American Free Trade Act in 1994, many manufacturers already view the United States and Mexico as a single market for production purposes. Manufacturing is returning from China. Starting in the 1990s, Mexico lost thousands of manufacturing jobs to China. Those job losses escalated emigration to the U.S. While China’s labor costs have soared in recent years, Mexico’s labor costs have remained fairly stable. According to the HSBC bank, in 2000 it cost just $0.32 an hour to employ a Chinese manufacturing worker against $1.51 for a Mexican worker. By last year Chinese wages had quintupled to $1.63 while Mexican wages had risen only to $2.10. Lower transportation costs make up the difference for many products. Transportation from Asia to America became much more expensive in recent years. The price of oil has tripled since 2000, making it more attractive to manufacture close to markets. A container can take three months to travel from China to the United States, but products trucked in from Mexico can take just a couple of days. The largest migration from one country to another in the history of the world temporarily halted during the recession. Net migration from Mexico to the United States fell from nearly half a million a year before 2008 to almost zero in 2010. What once was a great flood remains a small trickle. Migration is occurring at its lowest level since at least the 1950s. 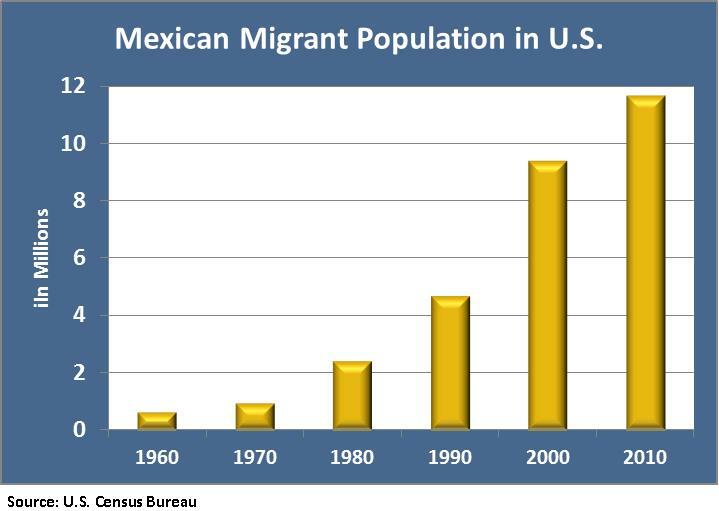 In the 1980s and 1990s, a swelling youth population and a booming economy in the U.S. began drawing many more Mexicans. The collapse of the Mexican peso in 1994 and the North American Free Trade Agreement, which made it harder for Mexican farmers to make a living, accelerated the migration. The surge continued until the U.S. recession began in December 2007. In 2010, for the first time, Asians were America’s biggest migrant group. The Pew Research Center estimated 430,000 Asians arrived, compared to 390,000 Hispanics. The steep drop in Mexicans entering the U.S. cut the number of Hispanic immigrants in half between 2005 and 2010, while the number of Asian immigrants grew steadily. Between 2011 and 2012, about 886,000 immigrants moved into the U.S. Between 2005 and 2006, 1.2 million immigrants entered. Net international migration into Idaho between 2011 and 2012 was 1,913. The recession’s impact is only one of the reasons fewer Mexicans are crossing the border. Fewer are feeling pressure to leave because of economic problems at home, and fewer are pulled by opportunities in the U.S. Increased border security makes the trip more difficult and expensive for undocumented workers. And once in the U.S., undocumented workers find life more difficult than a few years ago. Laws restricting illegal immigrants’ rights or making it tougher for employers to hire them have passed in more than a dozen states since 2006. Increased prosecution in the United States means getting caught without papers now could torpedo any chance of a visa later. If the immigration to the U.S. from Mexico remains relatively low, the U.S. population growth will be slower, the aging of the population will be faster and the availability of workers will be less. That could mean some real challenges for Idaho industries that rely heavily on Latin American immigrants including agriculture, food processing, construction, cleaning services, lodging and restaurants. Most U.S. Hispanics are born in the U.S. Some Hispanics have ancestors who were American citizens for decades while others are recent immigrants. Hispanics make up 47 percent of the foreign born in the U.S. and 58 percent in Idaho. About 36 percent of U.S. Hispanics are foreign born, and 31 percent of Idaho Hispanics are foreign born. Hispanics make up 17 percent of the U.S. population and 11 percent of Idaho’s population. Of the U.S. Hispanic population, people of Mexican origin – their ancestors came from Mexico or they themselves came from Mexico – make up 65 percent. Of Idaho’s Hispanic population, they make up 88 percent. Immigrants from Mexico make up 27 percent of the migrant population in the U.S.
About 3.9 percent of Idaho’s population is foreign-born, compared to 8.7 percent of the U.S. population. The five Idaho counties with the highest percentage of population that is foreign-born are Clark at 15 percent, Lincoln 10.4 percent, Jerome and Gooding 9.9 percent and Blaine 8.8 percent. This entry was posted in Employment News and tagged economic growth, idaho department of labor, Mexico, migration on July 9, 2013 by Idaho Department of Labor.